According to the survey of KPMG 74% of the world leading companies are using GRI as a reference for their reporting. 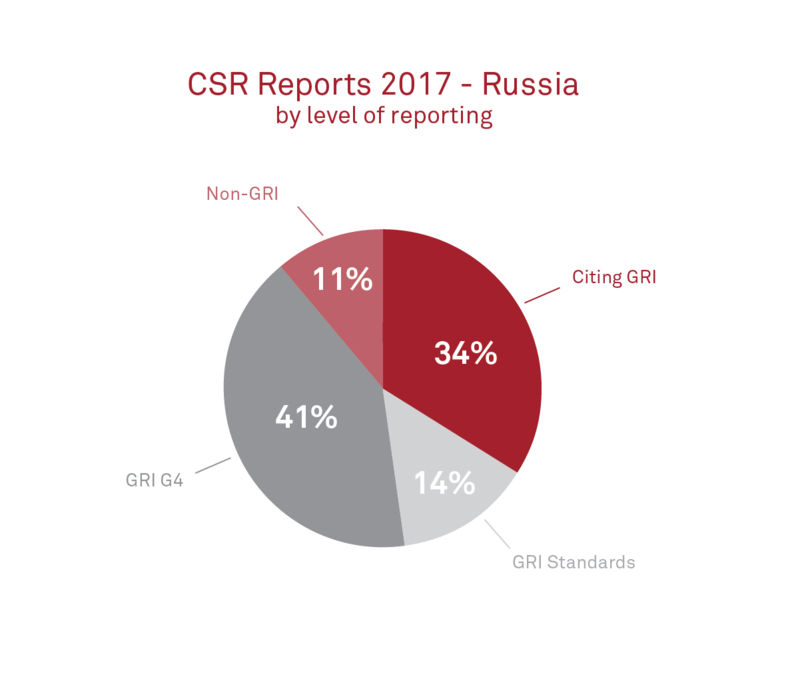 (1*) Also in Russia, GRI has been established as the leading framework for sustainability reporting. 66% of the reports are written in accordance with GRI or citing GRI as a reference. The majority of the reports (41%) are based on the GRI G4 guidelines, which remain valid until 1 July 2018. The Standards launched in 2016 are not yet used very often. 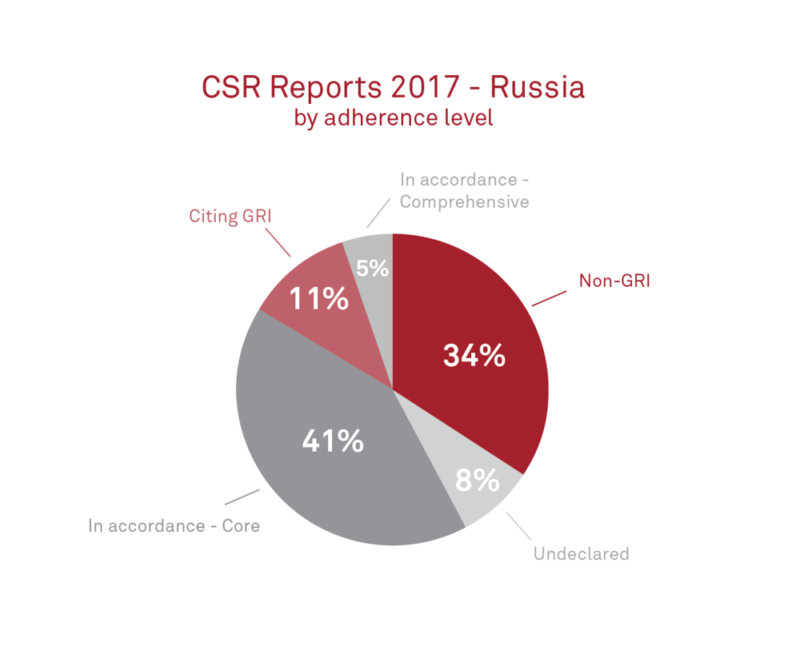 Three out of four Russian organizations choose the “Core“ option when reporting according to GRI. Only 4 reports (5% of the reports) in Russia published in 2017 apply the “Comprehensive” option. (1*) KPMG (2015). Currents of Change. The KPMG Survey of Corporate Responsibility Reporting 2015. 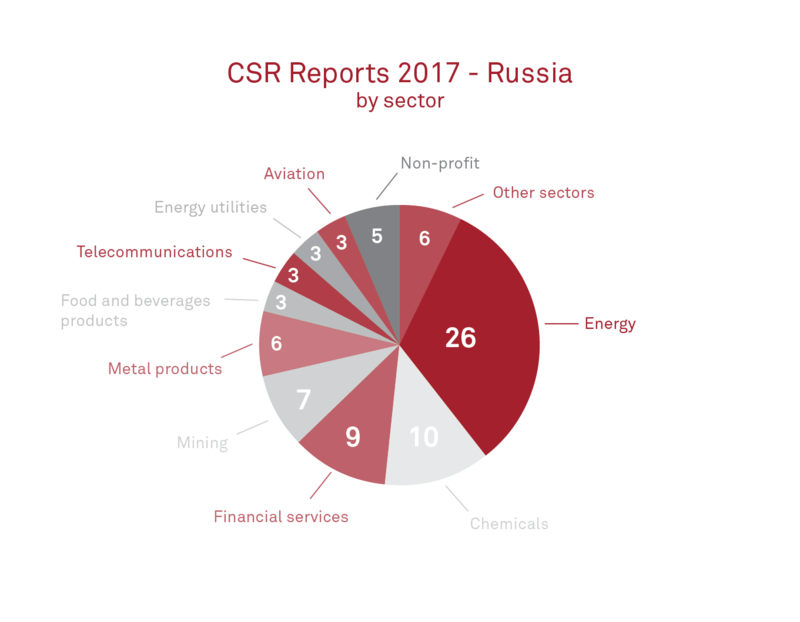 Most of the sustainability reports in Russia are produced in the Energy sector (26), followed by Chemicals (10), Financial services (9), Mining (7), and Metals products (6). In the past, organizations have replaced the term ‘sustainability’ with ‘Corporate Social Responsibility’ (CSR). The launch of the Sustainable Development Goals (SDGs) has given a new drive to the term ‘sustainability’. Many reporters indeed tried to align their sustainability targets with one or more of the 17 SDGs. A recent survey showed that „62% of global firms surveyed are now reflecting SDGs at some level in their reporting.“ This trend can be observed in many countries and will be increasing in visibility in the coming years.